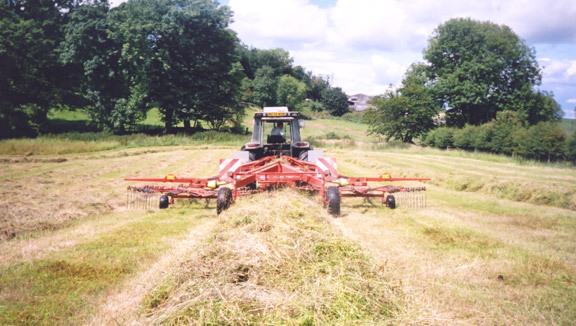 On 8 February 2006, Sovereignty was interviewed by Green Futures, the magazine of Forum for the Future, on the concept of Fair Trade for UK Farmers. The following is the notes prepared by Alistair McConnachie which appeared as an article in the February 2006 issue of Sovereignty. 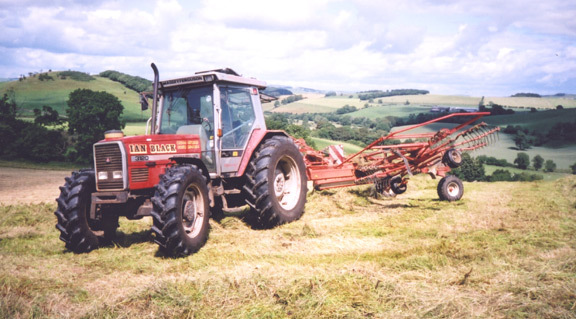 Pictures: Contractor rowing and baling the silage at the McConnachie family farm, South West Scotland, July 2005. The seven principles of the "Fair Trade" concept -- which relates traditionally to trading with the developing world -- are: Fair Wages, Co-operative Workplaces, Consumer Education, Environmental Sustainability, Financial and Technical Support, Respect for Cultural Identity, and Public Accountability. The essence of the concept, however, is the payment of a "fair price" which ensures economic sustainability for both the producers and retailers, working together within a long-term mutually beneficial relationship, enabling both to plan ahead in economic security. How can that concept be translated into a UK context? Clearly there are considerable economic, social and cultural differences between the context of struggling farmers and poverty in the developing world, compared with struggling farmers and levels of rural poverty as they exist in the UK. Therefore, it would be inaccurate to make a direct comparison. However, if we locate the plight of British agriculture within the context of economic globalisation worldwide, then we can understand that many of the same economic dynamics are operating in this country, as operate in the rest of the world, even though the surrounding circumstances and consequences may be different. The dominating economic concept underlying globalisation is one of "international competitiveness and efficiency" regardless of how socially or environmentally damaging this may be. For example, as a result of economic globalisation, we have the worldwide phenomena of more and more farmers being driven off the land. We have the dominance of large corporations in the food chain, who are able to dictate terms. We have ownership of land passing into fewer and fewer hands. We have more and more unnecessary trade, where we import goods we could produce ourselves, or export to countries who could do the same. This is the inevitable result of the economic model of globalisation, and in response to that we advocate economic localisation -- which means discriminating in favour of, and orientating the economic system towards, local and national needs and markets. Fair Trade for UK Farmers would be part of that localising process. Sovereignty encourages the NFU to explore and promote Fair Trade for UK Farmers -- and we suggest that if they did so then they would tap into a considerable amount of latent support among the public. There are three things which the NFU must do if it is to make maximum gains from this idea. It would be a mistake for the NFU to see Fair Trade as just a temporary, fashionable bandwagon upon which they could jump, and which might offer a quick, short-term way of helping a few members to make some money. Rather Fair Trade as a policy should be embraced within a much wider programme of localising policies. A lot of what the NFU says, economically, is responsible for the demise of British farming. It emphasises "international competitiveness and efficiency" and seems to suggest that if its members don't become "efficient" then they should go to the wall. The results of that globalising mentality are all around us. So the NFU will have to learn that it will not be able to talk "Fair Trade localisation" out of one side of its mouth and out of the other talk about British farmers "becoming more efficient in order to survive in the global market place" and other mantras which will inevitably mean that British farming goes under. The reality is that British farmers cannot compete with the international market. For example, how can a Scottish sheep farmer in the midst of a bitter winter compete with a New Zealand farmer who can ranch his sheep in mild weather all year? If it embraces the concept of Fair Trade then it will have to change its fundamental ideas from globalisation, to localisation and national food sovereignty. It would be wrong if it framed Fair Trade as some kind of appeal to charity. British farming is not a charity, it is an essential part of our country. The Fair Trade movement taps into people's sense of economic justice. People buy Fair Trade because they want to do what is right for the developing world and they want to support a fair and just economic system. The same dynamic could easily apply towards British produce. 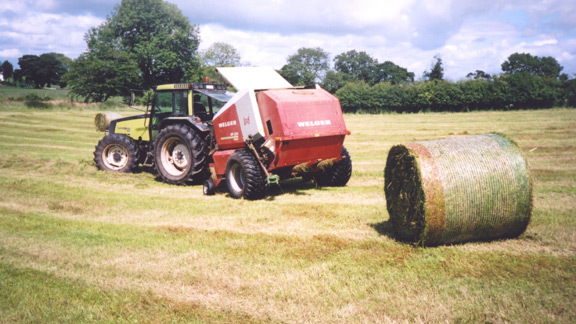 It would reflect an attitude to living, to politics even, which locates British farming and growing within a wider national and global context, where the consumer is keen to do what is economically just, and where the consumer is able to use ethical purchasing as a direct means of challenging economic globalisation. Fair Trade in the UK needs to be framed in that positive, visionary, revolutionary sense, located within the wider struggle against globalisation and for economic and food sovereignty. Ethical purchasing is part of a revolutionary attitude towards life which is seeking to create, to build, to bring forth, to give life to a positive vision of a localised economic world which stands as an alternative to the faceless and economic imperialistic globalisation of today. This is an attitude to life which is about growing and building, not about dying and collapsing. This is a struggle which is not about compassion, but about solidarity, not about charity but about justice. Imagine an NFU which made a stand for economic localisation and for food sovereignty nationally and globally, and based all its philosophy and policies upon those two legs. It would be very attractive across the political and social spectrum and it could be a leader in social, economic and cultural change for the better. It could have huge appeal. It is uniquely suited to lead debate in this area. It needs to embrace the concept of Fair Trade for UK Farmers.